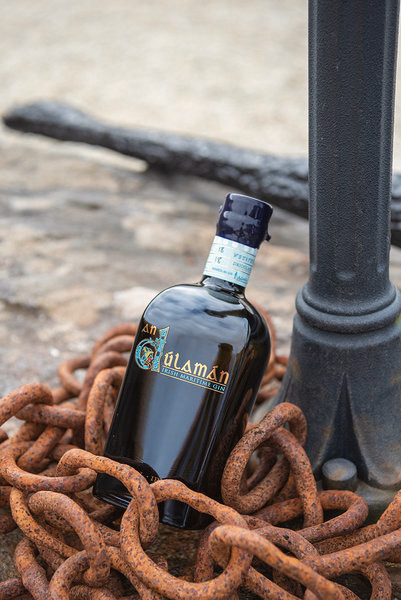 An Dúlamán, Irish Maritime gin is a London Dry Single Shot gin made by Sliabh Liag Distillery in South Donegal. Sliabh Liag Distillery produces An Dúlamán with 11 botanicals, 5 of which are seaweeds, harvested by hand around the Sliabh Liag Peninsula. The resulting Gin is as unique as the Donegal Coast itself. An Dúlamán Irish Maritime Gin is the first gin distilled in Co. Donegal. Dúlamán is the name of an Irish folk song which relates a conversation between two seaweed collectors (it is also the Irish word for channel wrack, one of our five shoreline botanicals). The coast around Sliabh Liag holds an extraordinary bounty for such foragers with their centuries-old knowledge of harvesting and harnessing the qualities of these natural products. An Dúlamán bottles are reminiscent of those found along the Donegal coast during the wrecks of the Spanish Armada. Each bottle is wax sealed and the batch number is linked to the lunar phases. An Dúlamán, Irish Maritime Gin. 50cl 43.2% abv.